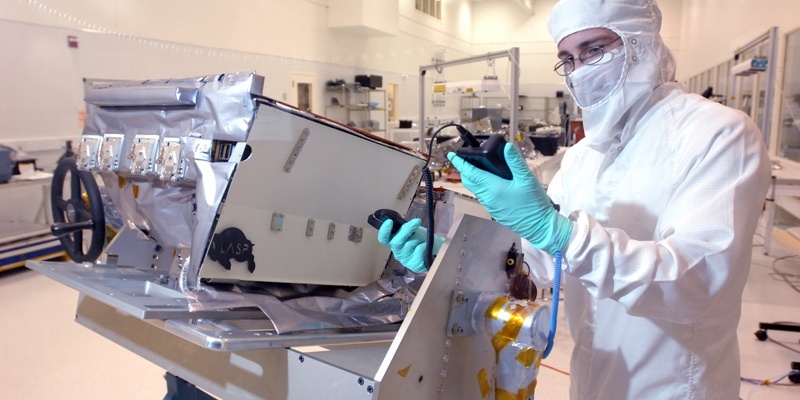 Literally every surface in a cleanroom needs to be wiped down regularly — from the air returns and filter grates to equipment, shelving, tables, utility carts, and more. Your cleanroom classification plays a role in the type of wiper that’s appropriate as well. Wipers can be made of polyester, nylon, poly-cellulose, cotton, foam, or composite materials; they can have pressure heat-sealed, ultrasonic-sealed, laser-sealed, wire-cut, or cold knife-cut edges; and they vary in size, inherent contamination, and absorbency. Make sure you know what you need, and keep plenty in stock to keep your cleanroom surfaces nice and clean. Your cleanroom’s floors need to be mopped regularly, and the type of mop you bring inside the controlled environment needs to be suited for that environment. Cleanroom mops are often made for single use, meaning the head is disposable and should be changed regularly. If you want to save a bit on costs, you could lengthen the life of your mop heads by protecting them with disposable cleanroom-grade covers. You’ll likely still be slipping these covers over disposable mop heads that will still need to be changed, they’ll just need to be changed less frequently than if they weren’t covered. If you don’t want to have to wipe down your mop handles every time they come in and out of the cleanroom, you could stock up on autoclavable adapters and save your cleanroom crew the extra work of cleaning the cleanroom supplies by hand. You can’t mop without a bucket! But, like everything in a cleanroom, buckets and any carts you use to roll them around need to be compatible with the environment. Look for bucket systems that can be sterilized regularly to keep your cleanroom’s contaminants under control. Vacuuming is common in cleanrooms down to ISO 5, but not necessarily on the floors. While floors are more often mopped, vacuums are great for removing any dust or particulate from walls and ceilings in addition to using wipers to keep them clean. But, of course, you can’t use the same vacuum you use at home in a cleanroom. You need to look for a sterilized or autoclavable model designed for controlled environments. Before anyone enters a cleanroom, they need to step on a tacky mat with the soles of their shoes to remove debris, then slip on shoe covers and step on another tacky mat on their way in. This helps minimize the amount of outside debris being brought into the cleanroom, thus keeping the environment under control. You can’t just walk into a cleanroom in your street clothes. Everyone who enters the controlled environment needs to be properly covered. Depending on the cleanroom classification, the required garments can include everything from a gown, hair net, and gloves to a beard net, safety glasses, and face mask. 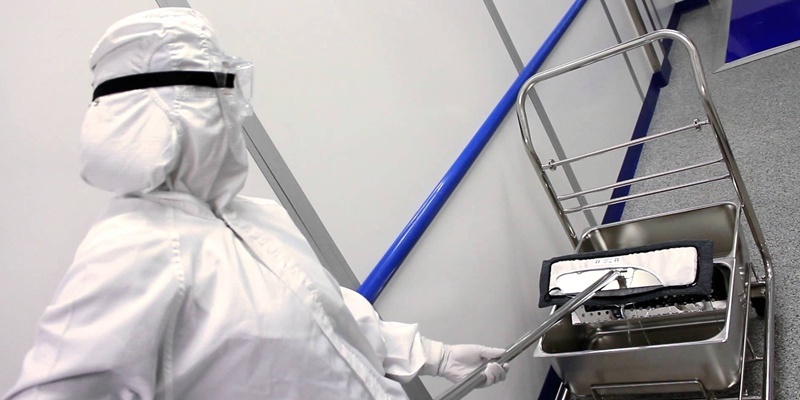 Part of a proper cleanroom cleaning procedure is using the right cleanroom supplies. Contaminants can be introduced from a variety of unexpected sources and in unobvious ways, so it’s critically important to know the ins and outs of what’s required for your cleanroom classification and what’s it’s going to take to remain compliant with regulations. While the cleanroom supplies listed above are some common staples of controlled environments, they’re by no means everything you’re going to need. Download our free cleanroom cleaning process guide today to dig deeper.